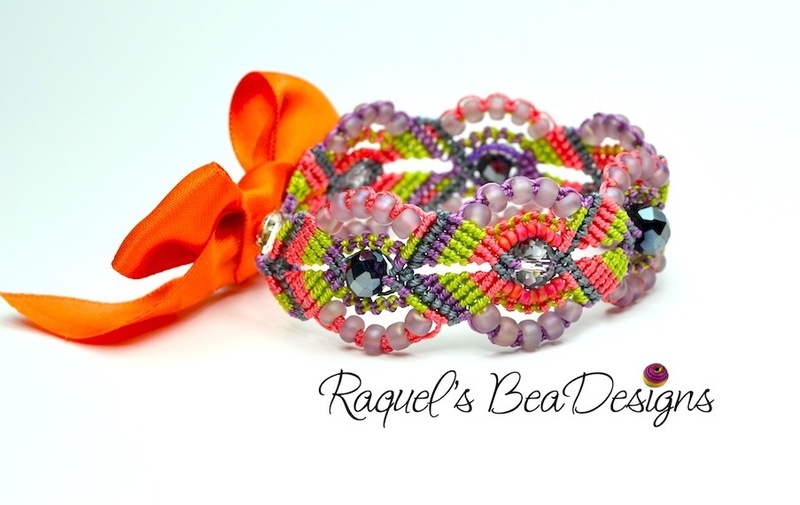 This is the style of macrame done by the Raquel Cruz, author of Kalmbach's new book Micro Macrame Basics and Beyond. I have been fascinated by macrame since childhood. Of course back then, when dinosaurs ruled the earth, think and colorful cords were hard to come by. I think everything I made used that terrible brown shreddy rope that ripped your hands apart while you worked. Then came beautiful C-Lon and other brands of nylon cord. All the colors of the rainbow, and no shreds! As you can clearly see, micro-macrame looks nothing like the old style. I've done a bit with half knots and square knots, but Raquel shows you how to combine these with lark's heads and half hitches to create beautiful patterns and gorgeous jewelry that are a far cry from the scratchy hippy jewelry and friendship bracelets of the past. But, if you want to make a beautiful friendship bracelet, now you'll be able to do that too! I really, really love doing macrame, and the first thing I learned to do was micro-macrame that used waxed linen, in '76. My mom's friend had a daughter close in age to me, and she asked if I wanted to learn. She had been making bracelets to wear to school. 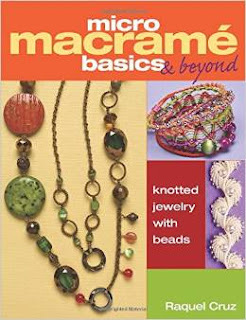 I started working at a craft store in '80, and macrame was a big seller with all of the various poly type cords--no hemp there. It was still selling well when I left in '82, but the next store I went to didn't have the selection, nor the sales of the other. I continue to do micro-macrame to this day, and although I have tried C-lon, I've been using other types of nylon thread/cord. I've used quite a bit of Omega brand thread, even though it is more for knitting and crocheting. I've figured out a way to keep it from slipping while tying (it is awfully slick), and have even dyed different colors. Would you like to share some of your work with readers here, Jen? I'm sure everyone would love to see some of the pieces you've made! I only have a few pieces on hand right now, and haven't done a lot of new things recently, but do have photos. What would be the best way to send them to you? I don't do anything elaborate, so don't expect them to look like some of the well known micro-macrame artists out there. I don't have much of an outlet to sell them, that's why I only do things as needed.